PwnageTool and Redsn0w have been updated, and both allow jailbreaking a range of iOS devices without tethering. This walk through covers PwnageTool 4.3, with another covering Redsn0w to follow. The main difference between the two apps is the method of jailbreaking. PwnageTool makes a custom Firmware file that iTunes puts onto the device. Redsn0w jailbreaks a device after iTunes has installed a standard Apple Firmware. Before starting a jailbreak using PwnageTool or Redsn0w you need the correct firmware for your device. I used a great guide at iClarified that links to every iPhone firmware that has been released. My iPhone is a 3GS so the firmware I wanted was the 4.3.1 (3GS): iPhone2,1_4.3.1_8G4_Restore.ipsw. Once downloaded and placed on my desktop I launched Pwnagetool 4.3. PwnageTool is the easier of the two jailbreaking tools, with a simple graphical interface hiding a lot of options if you choose Expert Mode. I wouldn’t recommend using Expert Mode unless you really know what you are doing, and in most cases Simple Mode will get the job done without problems. In the next step I’ve selected the iPhone 3G, 3Gs, 4 option. 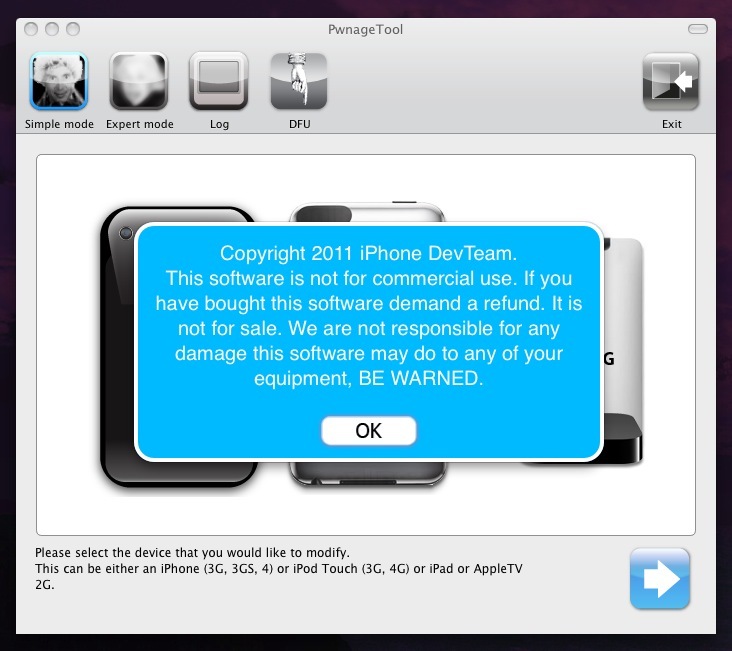 If you haven’t already downloaded the Firmware bundle required PwnageTool will show this warning. Clicking yes here will open the iClarified page mentioned above. Once the Firmware was downloaded and placed on the desktop Pwnagetool found it very quickly. It also confirmed the Firmware was for the correct device. A simple explanation of the next step. One more question before the Firmware gets hacked. The next stage takes a few minutes, and ends with the custom Firmware file (with the .ipsw extension) appearing on your desktop. When the custom Firmware is ready PwnageTool will take you through the steps to put the iOS device into DFU mode, required to update the Firmware. One the device is in DFU mode iTunes is used to restore the custom Firmware. Launching iTunes with the device connected shows this message. Holding the option key while clicking the Restore button brings up a file open dialogue. Select the custom firmware that PwnageTool made. One last warning and chance to cancel. At this point the restore should start, taking a few minutes to update the device. I received a 2005 error message. A web search shows a range of solutions to fix this problem, so it’s not a major fail. I didn’t go any further as I also wanted to try Redsn0w. It’s worth mentioning that I am using a hackintosh, not a genuine Apple Mac, which may contribute to this problem. Sometimes PwnageTool has worked for me, sometimes I get this error or a different code. When this happens I use Redsn0w, covered in the next guide. I don’t have a iphone. I use a Ipad.